The scorching summer sun and day dreams of the beach go well together. 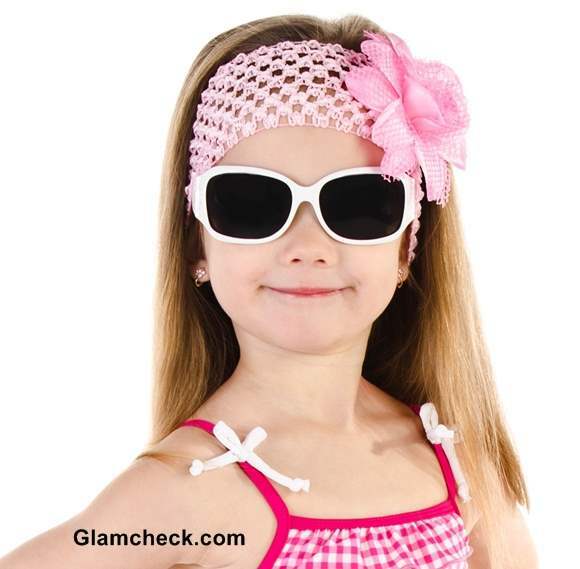 And especially so for little girls who love to swim in the cool water and spend fun time with friends at the beach. 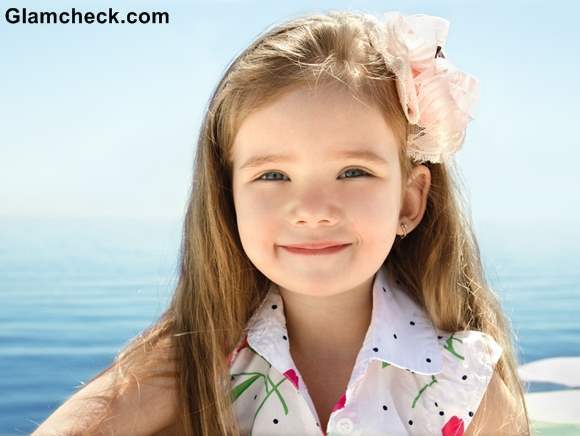 So if that is the plan for your little one and she is set with her cute swimwear, her mommy dearest needs to give her a cute hairstyle to match. 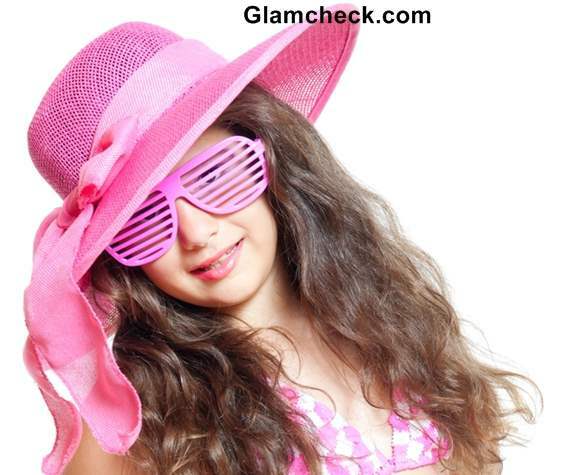 After all dressing up is great fun in itself for a little girl. 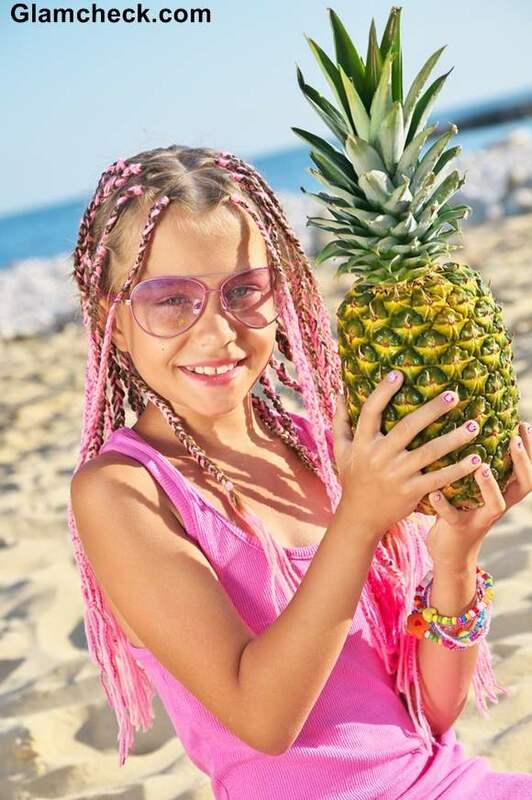 So, if you are looking for some fun beach hairstyle ideas for your angel, we got you covered. 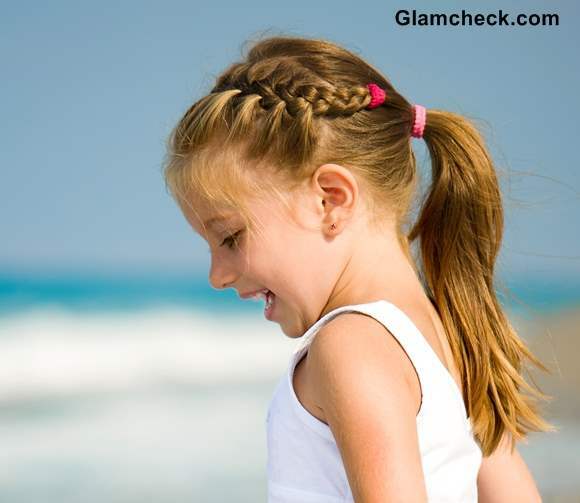 Braids are a neat, clean and easy to maintain hairstyle at the beach. Though, in no way does it spells boring. You can see for yourself the plethora of options possible using braids. You can divide her hair in half from the centre, leaving the front fringes alone. Using a colorful rubber band tie a pony on each side, above the ear. Start braiding each pony using the 3-parts method and secure the ends with bright bands. A very charming hairstyle is ready! As a variation to the usual pigtail braid featured above, you can transform the whole look by replacing the 3-strand braid with the fishtail braid. Skip tying the pony on both sides with a band, for this one. 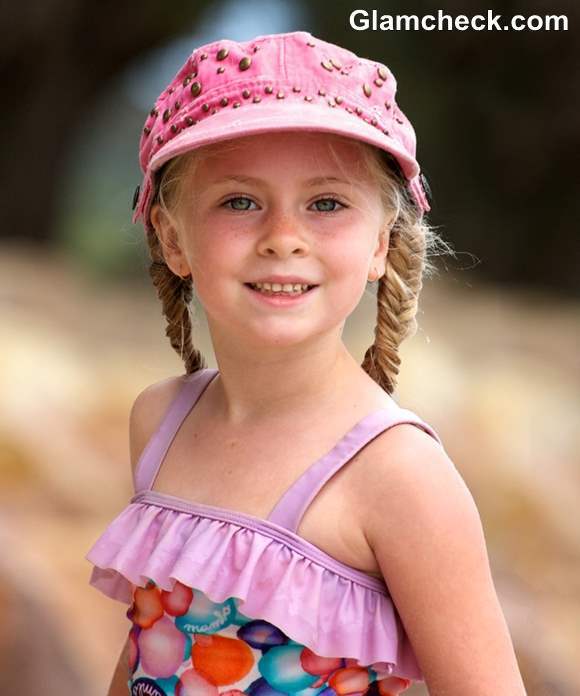 Your little one can sport a cap too with the fishtail braids. Making tiny braids all over the head is another attractive hairstyle. Take small sections, use the 3-strand braid method on each one and secure the ends with vibrant rubber bands. If take even tinier sections to braid, using the 3-strand method secure with plastic beads at the end as kids love them – both the colors and their noise when they shake their head. Keep a narrow tooth comb handy for this one and braid tightly. Next comes a rather intricate braided style for the beach, inspired from the last one. The feel of this one is very exotic. You will need multiple thin ribbon strands for this one. Each ribbon strand should be little more than double the longest length of hair. Take a small section of the longest hair and attach two ribbons at the start by wrapping. Divide the hair into 3 sections (with the ribbon single ribbon strands in two sections and double in the last). Braid all the way till the end using the 3-strand method, securing the end by tying the ribbons. For the shorter hair in the front, use the same 3-strand braid till the length of hair ends, tie the ribbon and with the remaining length of the ribbon braid using the 4-strand method. It would result in pure ribbon braids at the ends. Accent braids add a unique twist to even everyday hairstyles; that is what makes them interesting. On one side, slightly away from the hairline, take a small section and French braid it to one side but not all the way till the end. Secure it with a bright band. Take the rest of the hair and also the remaining hair from the braid and tie them into a pony. Twists and knots result in a very natural looking hairstyle and they create a great focal point. Knotted buns and pony both fall under this. The knotted pony is as simple as it gets. Hold all the hair together in hand and separate a small section out. Use this to wrap around the hair and secure with bobby pins after knotting. So, instead of a rubber band, the wrapped hair keeps the pony secured. Decorate this hairstyle with butterfly or floral pins . For this one, just comb the hair with your fingers. The messier the better. If you want the bun on the right side, then start twisting your from the left to right. When you reach the right, tie a pony tail. Now twist the ponytail and warp around the base but in a messy way. Leave the ends of the hair loose and secure with hair pins. Add flower or butterfly pins to this one as well. When there is just no time to invest in making hairstyles, your go-to friend are hair accessories. The big, cute, colorful ones surely scream beach. On one side, near the ear pin a real flower using bobby pin or if you have an artificial one you can stick it on a tic-tac pin to make your very own flower hair brooch. A side ponytail with a big flower rubber band adds fun detail to it. Add matching sunglasses with the flower. If your angel has naturally curly or wavy hair, make her wear a hairband matching to her hair color with an artificial corsage flower attached to it. This will keep her hair away from her face in style. Real flowers, as mentioned above, too can be fixed in hair with ease. Cut the stem leaving only about an inch. Using a bobby pin, fix this stem at the end of the bobby pin and pin it in her hair. Corsage pins and hair bands are also available in a lot of stores today. 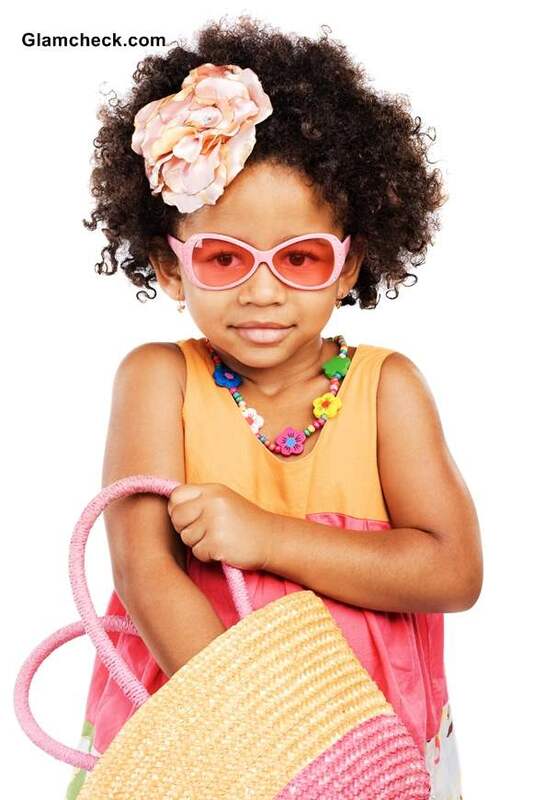 Colors like pink, peach, red and yellow remain a little girl’s favorite. Other ways of accessorizing beach hair is of course with a hat. Saves your kid from the sun in style. If her hat didn’t come with a ribbon, tie one, or even a printed scarf to make it unique. And if it’s a party we are talking about, shutter shades are a must. The last but not the least, let your girl sport a wide crochet head band with a corsage. Match it with her beach clothes for maximum impact. 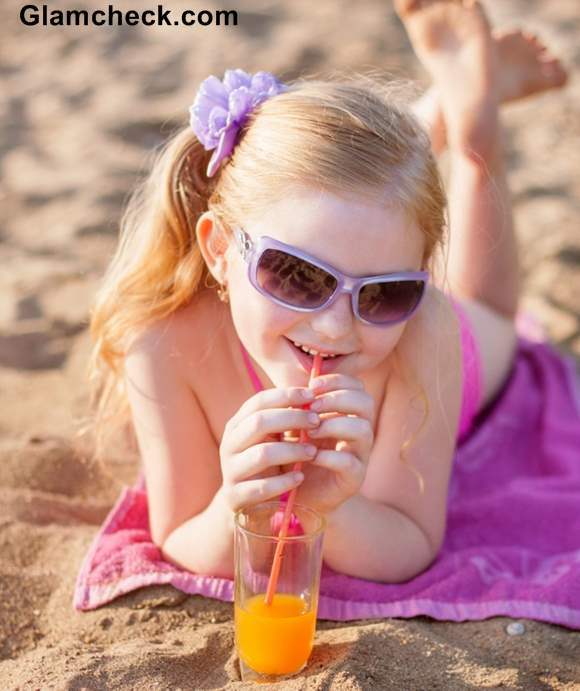 This indicative guide is enough to take your angel through great beach fun this summer. 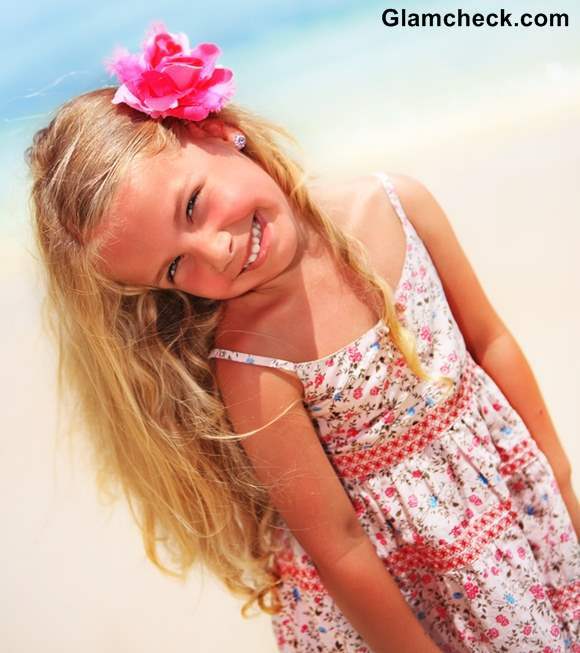 Do remember to ask her about her hairstyle of choice too and hairstyling can become a bonding activity for you both.